What a kid-friendly idea! 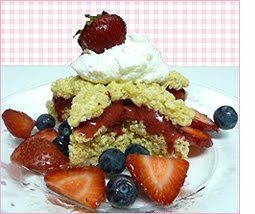 The Mommy Insider has this wonderful Rice Krispies treat recipe that is perfect for your Independence Day celebration. Admit it, everyone loves Rice Krispies treats, and this looks absolutely wonderful. Years ago when I started making these with my children we used the original recipe that was published. Since then, I've discovered that the recipe has been changed. I'm so glad I had the good sense to write down the original recipe all those years ago. My copy is a little smeared and yellowed, but still readable. For all of you who have never tried the original, you're going to love it! Melt butter in large saucepan over low heat. Add marshmellows and stir until melted and well blended. Cook 2 minutes longer, stirring constantly. Remove from heat. Add cereal and stir until well coated. Press mixture evenly into buttered 13 x 9 x 2-inch pan. Cut when cooled. Let the kids help and have a great time!